Real interest rates have fallen to historic lows, and some economists are concerned that an era of secular stagnation has begun. Today, the US government can borrow for ten years at a fixed rate of around 2.5%. Adjusted for expected inflation, this translates into a real borrowing cost of under 0.5%. A year ago, real rates were actually negative. With low interest rates dominating the developed world, many worry that an era of secular stagnation has begun (Summers 2013). The prevailing view is that the downward trend largely reflects a fall in equilibrium or ‘natural’ interest rates, driven by changes in saving and investment fundamentals (IMF 2014). In other words, a higher propensity to save in emerging economies, together with investors’ growing preference for safe assets, has increased the supply of savings worldwide, even as weak growth prospects and heightened uncertainty in advanced economies have depressed investment demand. 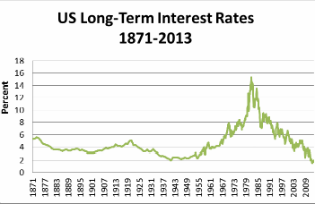 This perceived decline in ‘natural’ interest rates, to negative levels according to many observers, is viewed as a key obstacle to economic recovery – it prevents monetary policy from providing sufficient stimulus by pushing real rates below their equilibrium level given the zero lower bound on nominal rates. How to stem the decline in equilibrium rates has thus become the subject of lively debate. Conspicuously absent from the debate, however, is the role of monetary and financial factors in explaining the trend decline in real rates. After all, interest rates are not determined by some invisible natural force – they are set by people. Central banks pin down the short end of the yield curve, while financial-market participants price longer-dated yields based on how they expect monetary policy to respond to future inflation and growth, taking associated risks into account. Observed real interest rates are measured by subtracting expected inflation from these nominal rates. Thus, at any given point in time, interest rates reflect the interplay between the central bank’s reaction function and private-sector beliefs. By identifying the evolution of real interest rates with saving and investment fundamentals, the implicit assumption is that the central bank and financial markets can roughly track the evolution of the equilibrium real rate over time. Moreover, central banks’ policy frameworks may be incomplete. By focusing largely on short-term inflation and output stabilisation, monetary policy may not pay sufficient attention to financial developments. Given that the financial cycle is much more drawn out than the business cycle, typical policy horizons may not allow the authorities to account adequately for the impact of their decisions on future economic outcomes. The fact that financial booms and busts can occur amid relatively stable inflation does not help. Financial-market participants are as much in the dark as central banks. And with banks’ ability – through the creation of deposits – to grant nominal purchasing power to borrowers without reducing it for other economic agents, market rates can deviate from equilibrium levels persistently. The quantity of credit adjusts to accommodate demand at the prevailing interest rates. The resulting economic trajectory, however, need not be sustainable. Things can go badly wrong. And so they have. Over the last three decades, several credit-induced boom-bust episodes have caused major, sustained damage to the global economy. It is difficult to square this reality with the view that interest rates, which set the price of leverage, have been on an equilibrium path all along. Variations in risk pricing and assessment are critical in this respect. A given level of the risk-free rate can be associated with many configurations of risk premia on a plethora of interest rates, with differing implications for saving and investment decisions. A proper account of equilibrium real interest rates must encompass these risk assessments. Here, monetary and financial developments figure prominently. For example, the ability of monetary policy to influence agents’ risk-taking has been increasingly recognised and documented (Borio and Zhu 2012, Adrian and Shin 2010, Jiménez et al. 2014). The focus on fundamental saving and investment determinants of interest rates is entirely logical from the perspective of mainstream macroeconomic models, which assume that money and finance are irrelevant (‘neutral’) for the output path in the long run (Borio and Disyatat 2011). But successive crises have shown that money and finance can have long-lasting effects. Not only can financial factors – especially leverage – amplify cyclical fluctuations, but they can also propel the economy away from a sustainable growth path. By influencing decisions to invest, variations in financial conditions affect the evolution of the capital stock, and hence, future economic fundamentals. An expanding capital stock during booms may help to constrain inflation and obviate the perceived need for monetary-policy tightening. At the same time, large changes in relative prices that typically occur in financial booms divert resources into surging sectors in ways that are not easily reversible. The long-lasting impact of the financial cycle becomes especially evident in the bust phase. The cumulative build-up in debt and associated resource misallocations – especially the overhang of capital – leave a legacy that takes time to resolve. And an impaired financial sector may also hold back new investment in productive sectors. Indeed, a growing body of evidence shows that output is permanently lower in the wake of a financial crisis (Reinhart and Rogoff 2009). Money and finance are far from neutral. All of this suggests that the trend decline in real interest rates does not just passively mirror changes in underlying macroeconomic fundamentals – it also helps to drive them. Low interest rates can sow the seeds of financial booms and busts. Policies that do not lean against the booms – but ease aggressively and persistently during busts – induce a downward bias in interest rates over time, and an upward bias in debt levels. This creates something akin to a debt trap, in which it is difficult to raise rates without damaging the economy. The accumulation of debt and the distortions in production and investment patterns induced by persistently low interest rates hinder the return of those rates to more normal levels. Low rates thus become self-reinforcing. It is no coincidence that the secular decline in real interest rates has occurred against a backdrop of a sustained build-up of debt (Figure 1). The drag of debt on growth has recently been vividly documented by Mian and Sufi (2014). Sources: IMF, national data, BIS estimates. This alternative perspective puts into sharper focus the trade-off inherent in ultra-accommodative monetary policy. Monetary policy cannot overcome structural impediments to growth. But the actions that central banks take today can affect real macroeconomic developments in the long term, primarily through their impact on the financial cycle. These medium- to long-term side effects need to be weighed carefully against the benefits of short-term stimulus. While low interest rates may be a natural response to perceptions of a chronic demand shortfall, such perceptions need not always prove to be correct – and can be very costly over time. Laying the foundations of a sustained recovery requires measures to strengthen public- and private-sector balance sheets, together with structural reforms aimed at raising productivity and improving growth potential (Caruana 2014). More stimulus may boost output in the short run, but it can also exacerbate the problem, thus compelling even larger dosages over time. An unhealthy dependence on painkillers can be avoided, but only if we recognise the risk in time. Authors’ note: This is an extended version of an article published in Project Syndicate on 10 June 2014. The views expressed are those of the authors and not necessarily those of their respective institutions. Adrian, T and H Shin (2010), “Financial intermediaries and monetary economics”, in B Friedman and M Woodford (eds. ), Handbook of Monetary Economics, Vol 3, Amsterdam: North Holland: 601–650. Borio C, P Disyatat and M Juselius (2014), “A parsimonious approach to incorporating economic information in measures of potential output”, BIS Working Paper 442, February. Borio C, M Drehmann and K Tsatsaronis (2012), “Characterising the financial cycle: don’t lose sight of the medium-term!”, BIS Working Paper 380. Borio, C and P Disyatat (2011), “Global imbalances and the financial crisis: Link or no link?” BIS Working Paper 346, May. Borio, C and H Zhu (2012), “Capital regulation, risk-taking and monetary policy: a missing link in the transmission mechanism?”, Journal of Financial Stability, 8(4): 236–251. Also available as BIS Working Paper 268, December 2008. Caruana, J (2014), “Global economic and financial challenges: a tale of two views”, speech delivered at Harvard Kennedy School in Cambridge, MA, 9 April. International Monetary Fund (2014), “Perspectives on global interest rates”, IMF World Economic Outlook, Chapter 3, April. Jiménez G, S Ongena, J-L Peydró and J Saurina (2014), “Hazardous times for monetary policy: what do 23 million bank loans say about the effects of monetary policy on credit risk-taking?” Econometrica, 82(2): 463–505. Mian, A and A Sufi (2014), House of Debt: How They (and You) Caused the Great Recession, and How We Can Prevent It from Happening Again, University of Chicago Press. Reinhart, C and K Rogoff (2009), “The aftermath of financial crises”, NBER Working Paper 14656. Summers, L (2013), Panel Remarks at IMF Fourteenth Annual Research Conference in Honor of Stanley Fischer. 1 Borio et al. (2014) find that relying on information about the financial cycle goes a long way to mitigating this problem, producing robust real-time estimates that indicate positive output gaps in the run-up to the crisis. Claudio Borio Head of the Monetary and Economic Department, Bank for International Settlements.